Some exciting news appeared recently that I thought I’d relay here for those that missed out on some interesting up and coming styles. 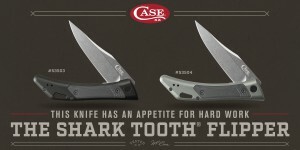 Case recently announced two things: firstly, the Bose collaboration knife has officially been confirmed. This year is a modification to the ever popular Trapper. Known as the Bullnose Trapper, this knife was inspired by a durable, heavy field knife Tony saw over forty years ago, and now faithfully reimagines it onto the Bullnose. In addition, a special edition of this knife will be released in July, featuring Dark Molasses Bone Handles and Raindrop Damascus blades. Now onto part 2 of the info, and this has a bit more pertinent information handy. The Shark Tooth is splashing back onto the scene! 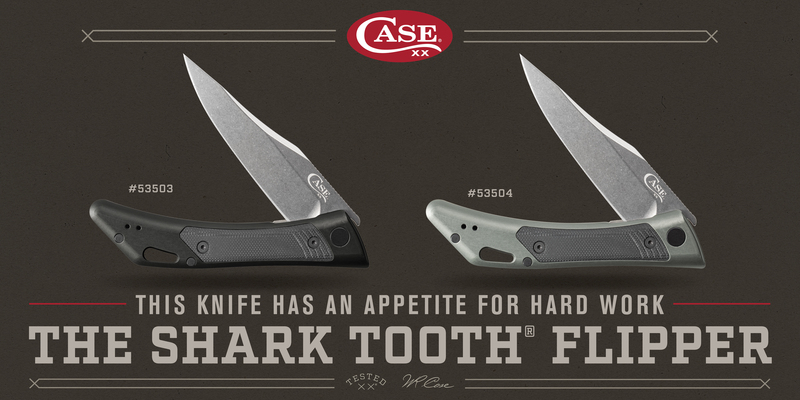 For a quick rundown for those not ‘in the know’, The Tooth was a knife design similar to the Mako, a locking folding knife with its release found on the far-end bolster and stood 5 inches closed. The reimaging of the Shark Tooth is an interesting approach. Rather than copy the original verbatim, they took the spirt of the knife and transferred it onto something fresh and new. The overall blade design has been shortened and transformed, instead of a normal locking blade design, Case shifted gears and went towards a Flipper variant, which, if you’re curious what I mean by that, take a look at the Southern Grind series Case has done. There’s a counterbalanced weight under the handle that allows for incredibly easy opening by simply applying pressure with a finger or thumb. Top the new look off with a S35vn steel and a durable g-10 handle, and this is certainly a knife a lot of people I’m sure can’t wait to get their teeth sunk into!